HomeSocial impact investment: Why are we here? In the last two weeks I’ve been at two major social impact investing events, both of which were conducted in the language of investors, and both of which left me actively searching for the perspective of social purpose organisations. There’s a lot of discussion about what social purpose organisations need to do to get investment ready, but where’s the conversation about what investors need to do to get impact ready? On September 3rd, the second night of the SOCAP conference, I attended an event held by Echoing Green, who support young social entrepreneurs. One of the young entrepreneurs was attending SOCAP. Four of her friends excitedly asked her what it was like. She said “I don’t know. I’m still trying to figure out if it’s for me. I go to these sessions, but I don’t understand what they’re talking about.” I asked her what the issue was. She said the language and the concepts were so foreign to her that she struggled to find meaning in the proceedings. Only that morning, Sir Ronald Cohen had said, “that’s what impact investment is about: enabling social entrepreneurs whether they’re working through not-for-profits or for-profits, to raise the capital they need in order to improve the lives of others, or the environment”. How did we fail to communicate this to our target market? 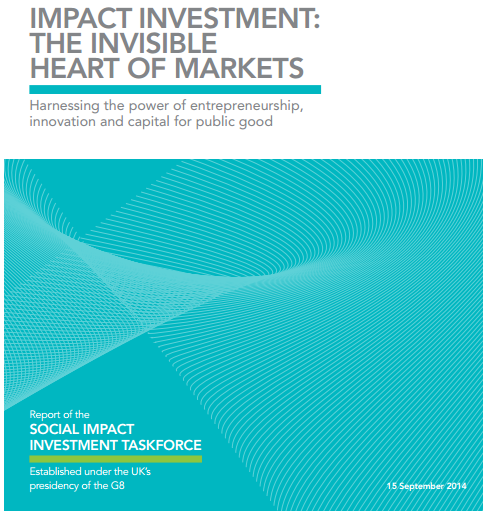 September 16 saw the Australian launch of Impact Investment: The Invisible Heart of Markets, the report of the Social Impact Investment Taskforce set up by the G8 and Delivering on Impact, the local companion report by Impact Investing Australia. Both reports strive to set an agenda for flooding the market with money and organisations to deploy it. Neither outlines the need for finance of social purpose organisations or the difficult journey they face to access it. The Charities Aid Foundation paper Returns Policy? What the next decade holds for social investment is much more considered on this front. The founder of SOCAP, Kevin Jones, said at one of the sessions “the biggest mistake I made was thinking that everyone saw the world like me”. The literature on social impact investing is almost always funded by investors, written by investors, launched by investors and attracts publicity from financial newspapers. Jed Emerson, Cathy Clark and Ben Thornley held a super fun workshop at SOCAP promoting multilingual leadership (communicating across the sectors) and yet every “expert” provided to assist our groups was an investor. Social Enterprise UK and the Big Lottery Fund recently released the only paper I’ve ever seen about social investment that is written for social enterprises Social Investment Explained. It was written by David Floyd and Nick Temple, both of whom have social enterprise backgrounds, and supported by Dan Gregory, one of the most valuable critical minds in the space. It’s almost shocking to read it and realise how investor-driven every other paper you’ve read has been. A good check as to whether a paper has been written in blind investor-speak, is to look for the words ‘supply’ and ‘demand’ [as per previous blog]. The use of these words on their own assumes that the reader looks at life through a finance lens. In reality a social purpose organisation will think of blood, beds, meals etc. when faced with the words ‘supply’ and ‘demand’. Even investor-centric papers can’t agree on a common meaning. 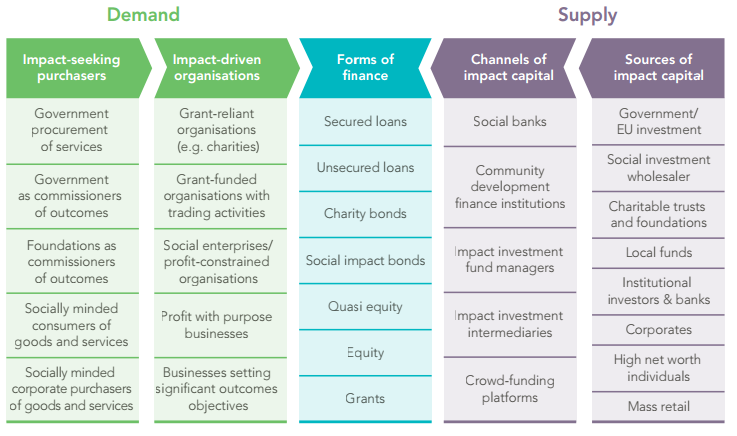 On page 3 of the G8 Social Impact Investment Taskforce report (below), ‘supply’ means investors, while ‘demand’ means organisations seeking money (there’s something about purchasers too, but I don’t understand why). On page 5 of the report Impact Investing For Everyone by Triodos bank, also for the G8 Social Impact Investment Taskforce, it’s the opposite: ‘demand’ now describes investors and ‘supply’ is used to describe organisations seeking money (below). I don’t think one is right and one is wrong. It’s just poor communication. For me, these two words are a red flag, immediately indicating disconnect between the writer and the organisations they are trying to support. I challenge everyone involved in promoting and designing social impact investment markets [including myself]: check that every conversation, every publication, every panel has at its heart the genuine perspective of social purpose organisations and the people they serve, and speaks in language they understand. Let’s remember why we’re here. This is visionary thinking. This is where a social investment market should start. ← Retail social impact investing – bring it! Rather agree with you that the benefactors of this conversation should also be at the table helping to shape it! What do you think of the comments made at the Australian launch that there aren’t enough social purpose organisations yet to take up the capital that is available?